Counting down from 6 kgs of strawberries. Now what to do? I knew right from the start that I would use some in this extravagantly deep cake. I love anything meringue, and the combination with a thin layer of sponge cake and fresh strawberries and cream is simply irresistable! The cake looks rather rustic (a royal mess really), as I do not possess Martha Stewart genes in the kitchen this is a fun cake to bake. Directions are quite easy and can be divided into two simple steps. 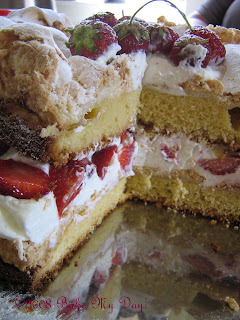 Baking the layers on day 1, and just prior to serving on day 2, whip up some cream and assemble the layers with the cream and fresh strawberries. Cream butter and sugar together until light n fluffy. Add vanilla, yolks one by one, beat thoroughly after the addition of each one. Sift the flour and baking powder on a sheet and fold into the egg mixture, alternating with the milk. Divide the mixture between the tins and spread the mixture evenly using the back of a spoon. Whisk egg whites until stiff but not dry. Add half the sugar, whisk until stiff and glossy, sprinkle remaining sugar on top and fold into meringue. 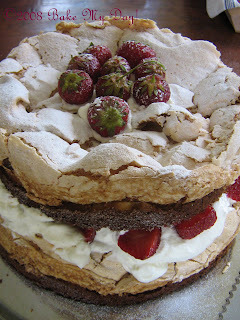 Either sprinkle one of the meringues with the almonds, or fold almond flour into half of the meringue mixture. Divide meringue between tins, on top of the uncooked batter and level the tops. 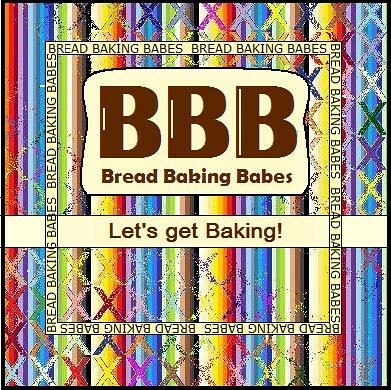 Bake cakes in a preheated oven for 45-50 minutes until golden on top and/or shrunk slightly from the sides of the tins. Unmold very carefully and let cool on a wire rack. Sponge side down of course! Slice strawberries, reserve a couple of the most beautiful to use as decoration on top. Whip cream, either with a little sugar added or just plain, until it holds shape and spread on the cake without the almonds. Top this cream layer with the sliced strawberries. Put the second cake on top of the sliced strawberries (again, sponge side down) and decorate with icing sugar and the reserved pretty strawberries. This is probably all gone but I know I'd be very happy with this on my plate.
) which can help enhance site interaction and reader's experience. pl contact me at saibose@gmail.com so that i can send you the widgets for your blog. PS: If you have multiple blogs, the widgets can help you in a traffic exchange as well. Wow! Now I fell a lot better. I was worried about the way mine looked, but yours looked about the same - see! Absolutely yummy. And yours turned out a lot better looking than mine!